This California coast road trip itinerary stretches from San Francisco in the north, to Los Angeles in the south. Mr M and I have done this road trip a couple of times now, and since I’m not a huge fan of spending seven hours straight in a car, we tend to break up the trip. 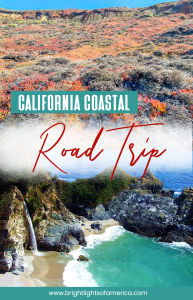 This post will hopefully give you some good tips on places to stop on your own California Pacific Coast Highway road trip. 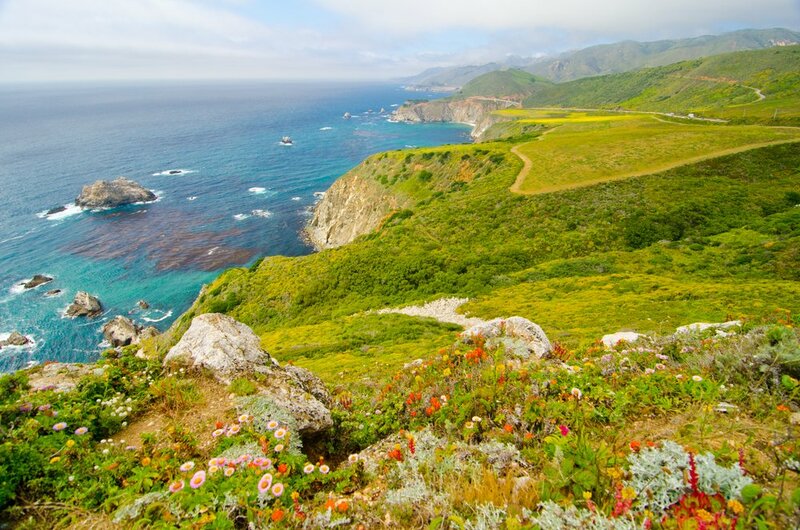 The California Pacific Coast Highway is known as one of the most beautiful stretches of coast in the world. Especially if you happen to drive it in the spring time, when wildflowers blanket the hills surrounding the road. 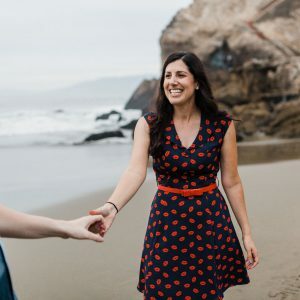 We’re starting from San Francisco and working our way south, and you can use this post to do whatever part of the Pacific Coast Highway you’d like, in whichever direction. There’s great stops along the way and the start and end points aren’t too shabby either. The jewel in San Francisco’s crown for many visitors is the iconic Golden Gate Bridge, seen here from Marin County. Whether it’s your beginning or end point, San Francisco has so much to offer that I recommend at least a week’s stay. If it’s your first time in the City by the Bay, it’s a good idea to set aside about a week to really immerse yourself in everything San Francisco and its surrounds has to offer. From checking out the Sea Lions lazing on pontoons off Pier 39, to sampling clam chowder from your very own bread bowl, and everything in between. 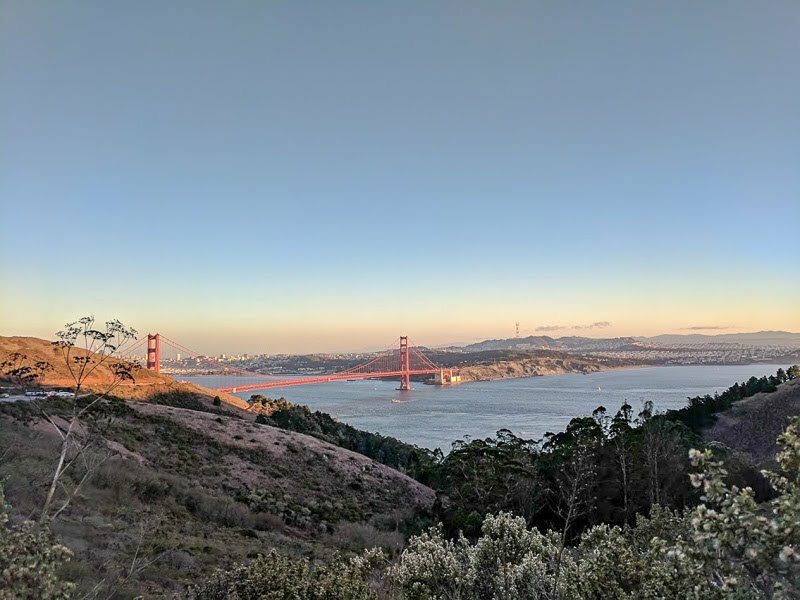 Don’t forget to visit the Golden Gate bridge viewing areas, or even rent a bicycle to cycle over the bridge to Sausalito for ice cream or a snack. 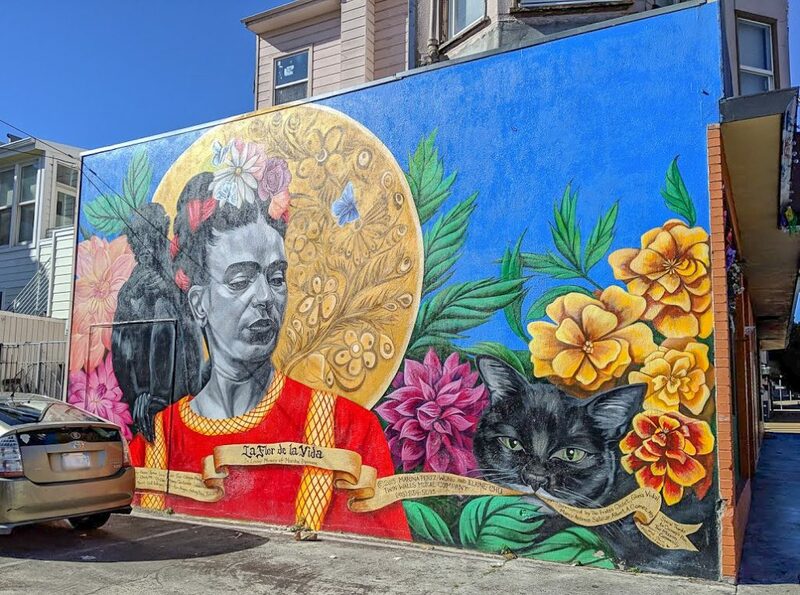 I seem to be focusing on the food, but you have to try a burrito from the Mission district, and appreciate some awesome street art while you’re there. See if you can find Lands End labyrinth hidden amongst the trees along the coast, go on a ghost tour, or check out some beautiful art galleries. and maybe rollerblade through Golden Gate Park. I haven’t even scratched the surface here though, so if you like what you’re hearing so far, definitely look over my 6 day San Francisco itinerary for all the great places to eat and visit while in the city. Despite the cold water, you’ll usually be able to see surfers out if there’s a hint of waves. We’re starting this road trip off slowly, so your first stop is just an hour and a half’s drive from San Francisco in Santa Cruz. When you picture a quintessential California coastal town from a movie, you’re thinking of Santa Cruz. It’s all about sun, sand and surf in this part of the country and for good reason. The swell ranges from small, gentle waves to those that dangerously crash against rocks along the shore. 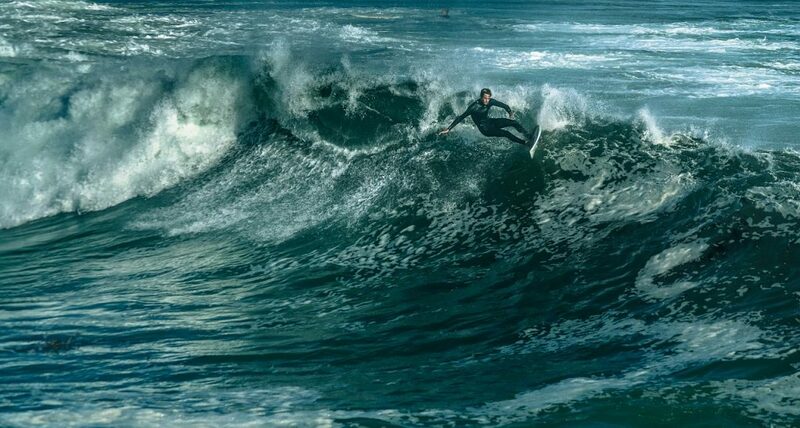 It’s a must for surfing enthusiasts to ride or even just to visit the Santa Cruz Surfing Museum across from Steamer Lane (an internationally renowned surf spot). It’s not all about the surf culture though. 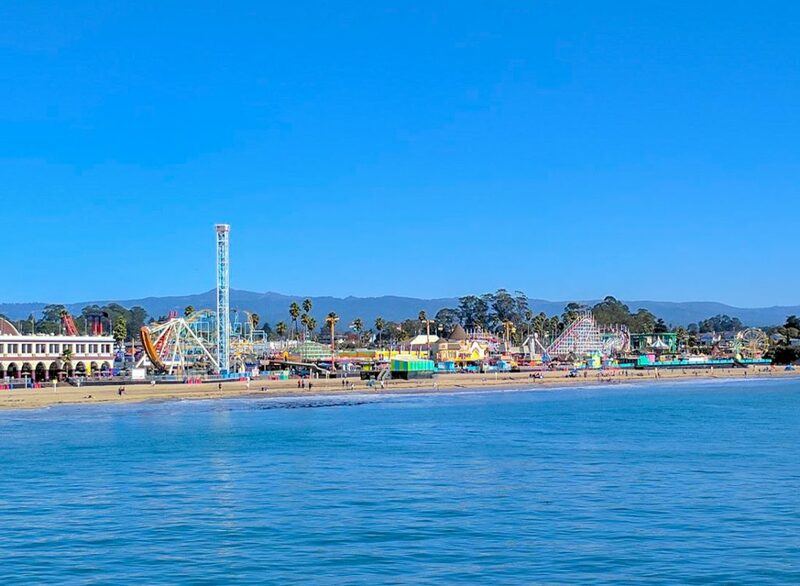 Santa Cruz also has the boardwalk of your dreams, filled with carnival rides, sideshows, and a pinball/video game alley that will knock your socks off. While you’re on the boardwalk, take a little stroll down the wharf for seafood restaurants and some seals enjoying the sun. The Santa Cruz Boardwalk is home to an arcade, and more carnival rides than you’ll need. If you’re more interested in butterflies though, drive along the coast to the Monarch Butterfly Natural Preserve between October and April to see thousands of the fluttering creatures settling in for the winter. While you’re there, you have to visit Natural Bridges State Beach for… the natural bridges made of rock that have been work into archways by the relentless tide over the centuries. This is just the tip of the iceberg when it comes to the Aquarium in Monterey. The place is filled with colour and sea life. A little less than an hour’s drive south will have you in Monterey, which boasts a rich history of fishing, art, and writing. As well as being the home of one of the Monterey Bay Aquarium that has around 1.8 million visitors wander through the three acre site each year. 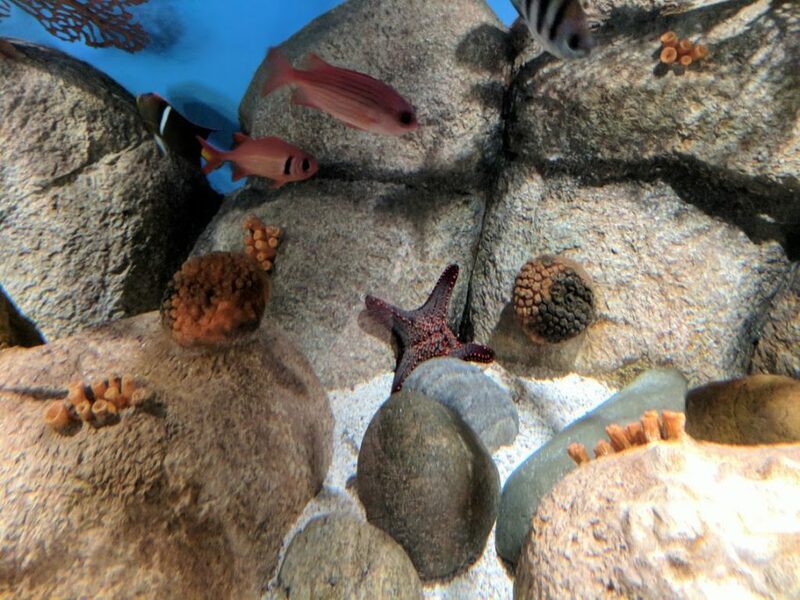 The aquarium has nearly 200 galleries and exhibits that include kelp forests, an open sea exhibit that is mesmerising at feeding time, and some very popular sea otters amongst lots of other draw cards. It is the only aquarium in the world to have released great white sharks, and reintroduce rescued sea otter pups to the wild. 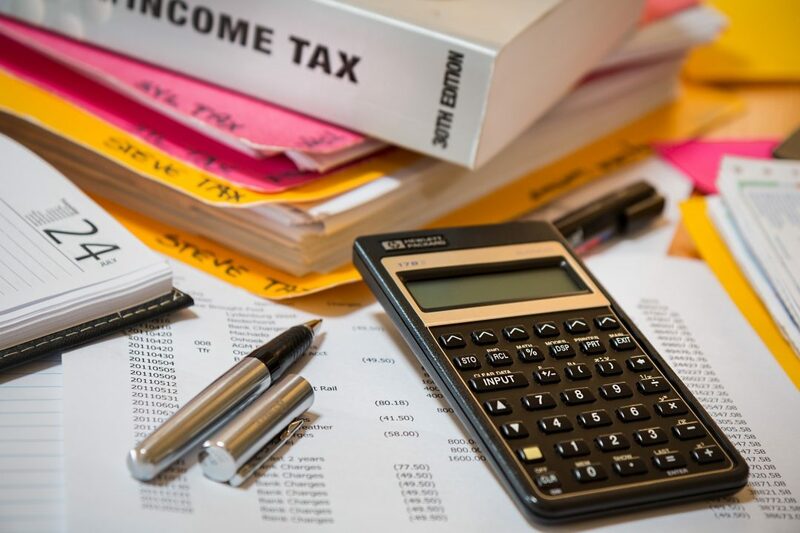 Stroll down Cannery Row to learn a little bit more about the town’s fishing history, and was once teeming with fishermen and those who worked in the numerous sardine canning factories along the stretch of road that boarders the coast. The street was actually only named Cannery Row in 1958, after John Steinbeck’s famous novel of the same name. Steinbeck is the area’s literary link, as he was born and lived in the Monterey area for many years. If you’re a literary-afficianado, you will want to see the monument to Steinbeck and his friends on Cannery Row. 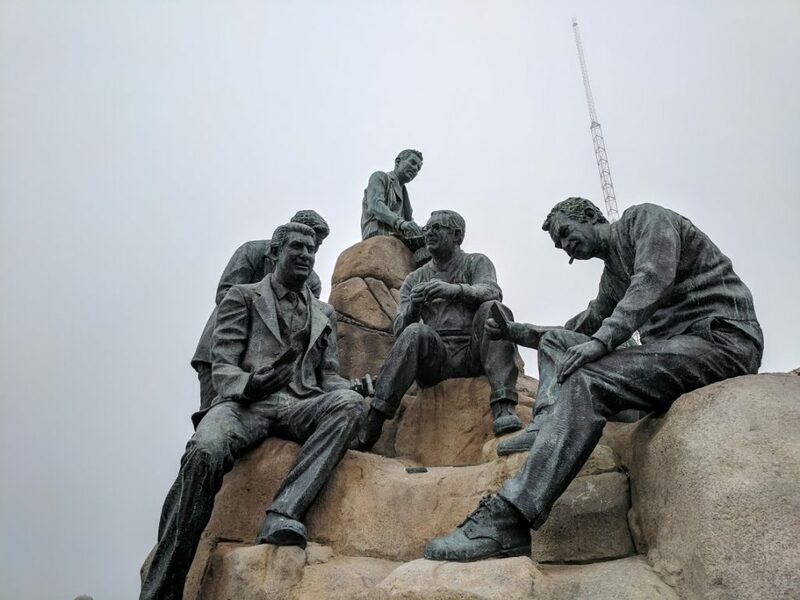 The monument, found in John Steinbeck Plaza, includes the author, with marine biologist Ed Ricketts, representations of those who worked on Cannery Row, and local entrepreneurs. Now to the artist portion of our Monterey tour – Spanish surrealist painter Salvadore Dali and his wife lived in Monterey in the 1940s. There’s a gallery dedicated to Dali in Monterey, called Dali17 (he lived on 17-mile Drive), which includes drawings, lithographs, paintings and other mixed media from his time in California. Brace yourself, bceause you’ll be hoping in your car for just 12 minutes (if you don’t hit traffic) for a pitstop at Carmel-by-the-Sea. If Monterey wasn’t high class enough for you, just wait till you get to Carmel-by-the-Sea. You can really smell the mould on the old money here, and I guess the fact that Doris Day and Clint Eastwood live there, is pretty telling. If you’re wondering, Day lives in a yellow home above Quail Golf Club’s 18th green, and Eastwood was the town’s mayor for a time after the 1986 election. Bing Crosby lived by Pebble Beach and even founded the Carmel Youth Center while he was at it. But enough famous golden oldies. Although I can’t believe I was so close to Calamity Jane herself! 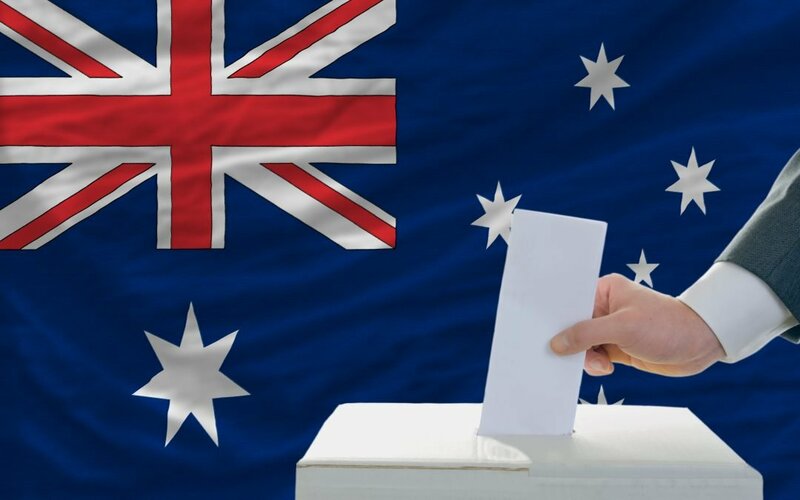 I love the area because it feels like a European town, complete with a beautiful High Street where you can visit numerous cellar doors for wine tastings, enjoy the cafe culture, or just shop like the one per cent do. (Well I assume they do anyway). Carmel-by-the-Sea is all about the ambience and atmosphere. But there are a couple of great things to do if you start feeling antsy. First you need to visit Mission San Carlos Borromeo del Rio Carmelo, then you need to exhale because it’s one hell of a name. The mission is made up of a Basilica, school, parish hall, museum and rectory, and was founded in 1770 in Monterey, but famous Franciscan Friar Junipero Serra moved it to Carmel a year later. The beautiful buildings have stood the test of time and it’s a ncie place to learn about the Missions. Spanish Bay Beach on 17-Mile Drive is just one of the many scenic stops on the road. 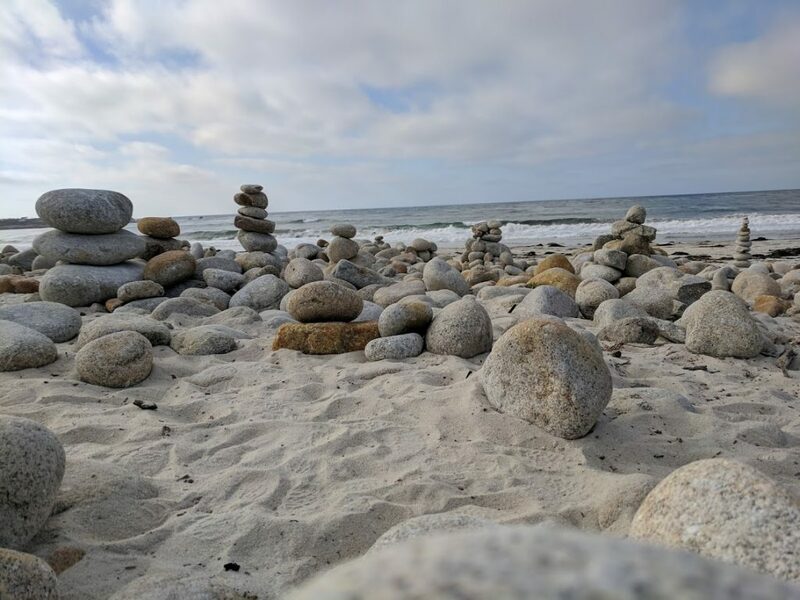 If you haven’t already heard of 17-Mile Drive, it’s time to educate yourself, because it is one of the most beautiful stretches of coastline in the world. So beautiful, in fact, that it has an entry fee for those wanting to drive through or visit (unless you’re staying in a hotel there). Depending on the time of year, you’re likely to see sea otters, seals, whales, and numerous sea birds along the drive. It has 17 scenic look out points, ranging from the unique Monterey Cypress trees, to a point where the sea is said to “rage”, to pebble -covered beaches. The Bixby Bridge is one of the most photographed in California. We’re really not doing that much ore driving before we hit the most famous bridge on this stretch of Highway 1 (not counting the Golden Gate). 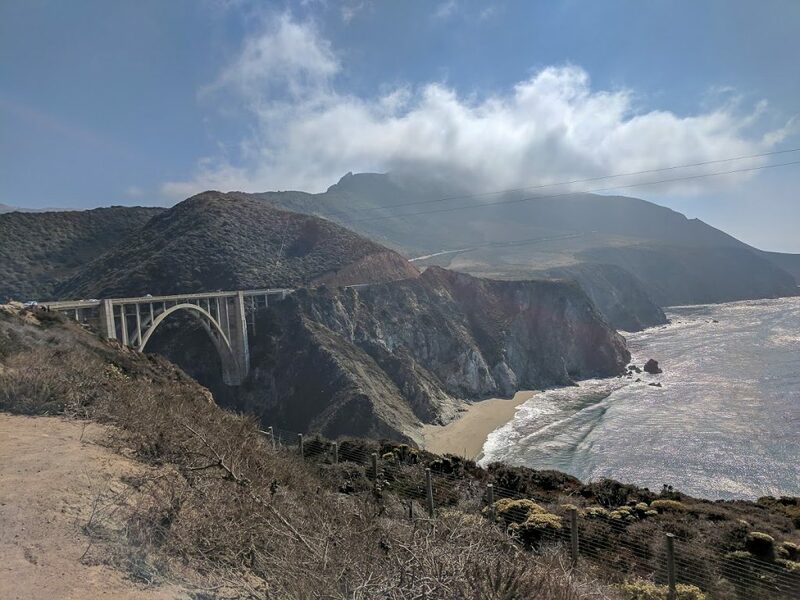 It’s just 30 minutes drive south of Carmel-by-the-Sea and it’s called Bixby Creek Bridge, but it’s also known as plain old Bixby Bridge or as I first heard of it in a Death Cab for Cutie song of the same name, Bixby Canyon Bridge. There are lots of turn outs and spots to park within photographic distance of the bridge, and you should use them to immerse you in the spectacular view of this engineering feat, backgrounded beautifully by nature. You can probably see why it’s so popular. The Bridge is suspended 80 meters above the canyon floor below, supported by California sea cliffs on both ends. Workers had to carry 45,000 sacks of cement up the scaffolding to construct the bridge back in the early 1930s. It was by no means an easy task. There’s no way for me to properly describe the views, so instead you’ll have to use my photographs to get the idea. Of course it’s way better in person. If you have the chance to stop, even for a short hike, head over to the McWay Waterfall. 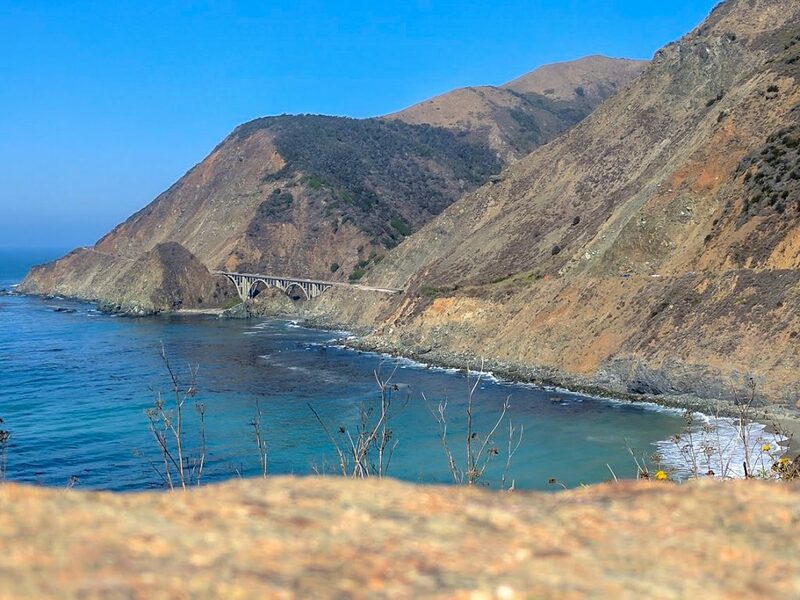 Measuring from the bridge to Big Sur State Park’s campground and cabins, you’ve got a 17 minute drive ahead of you. I would highly recommend staying in a cabin (or tent if you’ve brought one) overnight at Big Sur for stargazing purposes. It is one of the darkest places in the state because the surrounding mountains shelter it from the lights of towns like San Luis Obispo or Monterey. Looking westward, since the mountains also tend to block out the horizon to the east, you’ll get a great view of the starry night sky if there isn’t any fog. 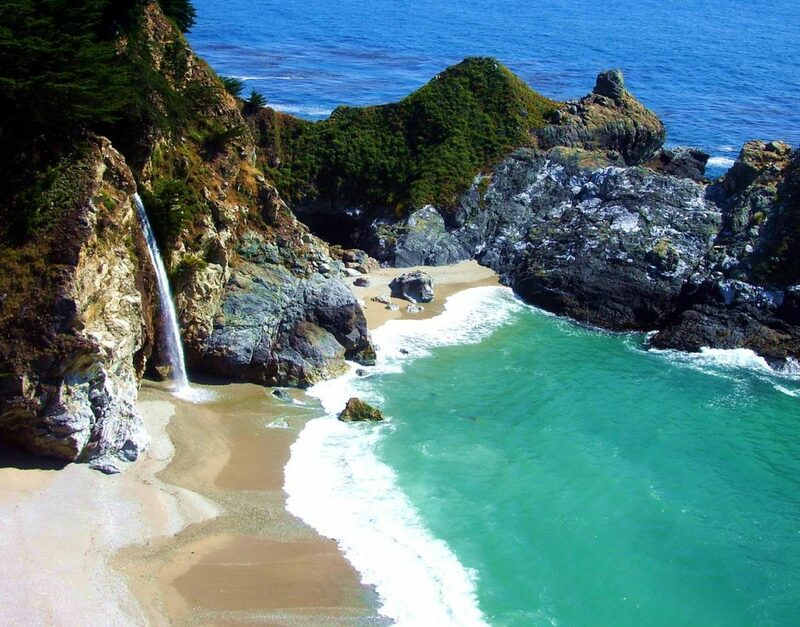 If you only have time for a short stop and hike, the McWay Waterfalls 1km hike is for you! It provides spectacular (and popular) views, and is short as can be. Get the full map and instructions for this hike right here. If you have a little more time, try the Ewoldson Trail, which measures 7.4km in length and gives you a variety of landscapes from redwood forest to canyon views. Get more information about the Ewoldson Trail here. Just a glimpse of Hearst Castle’s Neptune Pool at Sunset. Finally, a proper stretch of driving to break up the monotony of stopping! Two hours and 20 minutes south of Big Sur, you’ll arrive in San Simeon, a blink-and-you’ll-miss-it town. What you won’t miss, though, is the Castle on the hill that looks down out to sea. 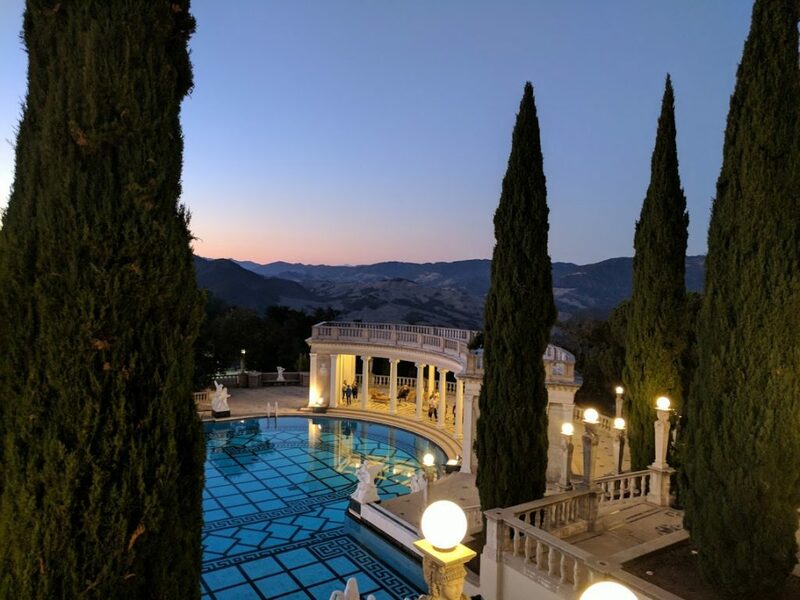 It once belonged to famous publishing and media magnate, WIlliam Randolph Hearst, who inherited the land from his father and set about building a compound between 1919 and 1947. What stands today of “Casa Grande”, has Hearst called it, are three “guest” bungalows that are basically full sized houses, and the large Caste, gardens, tennis courts, two pools, and 41 fireplaces. The guest houses alone include 46 rooms, and the castle boasts 115 rooms including a Refectory, Theater, Library, Beauty Salon, and Billiard Room. There’s an indoor Roman Baths inspired pool and an outdoor Neptune’s Pool that will take your breath away. 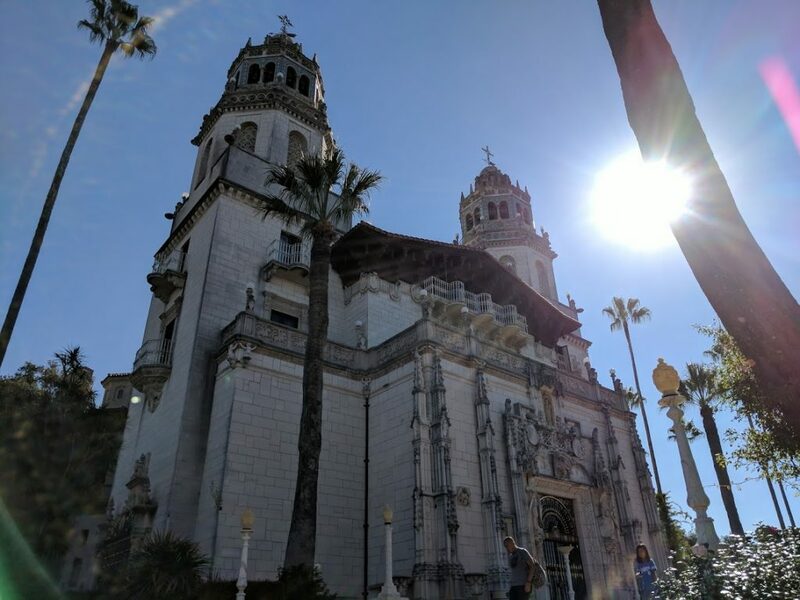 Hearst was a “collector” of art and antiques, and Hearst Castle was just one place that he showcased his collections. From Spanish ceilings, to choir stalls, paintings to frescos, and numerous sculptures – Casa Grande was a Europhile’s dream come true! 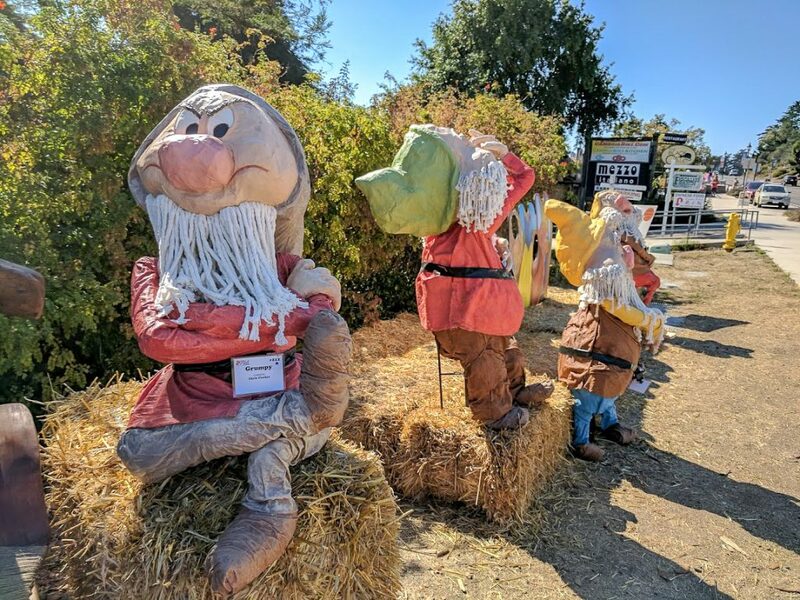 Cambria holds a Scarecrow Festival in October each year and it gets pretty creative. Just a few clicks down the Highway (as we’d say in Australia) is the small town of Cambria. Visit during October and you’ll see the town crawling with scarecrows. We saw the Seven Dwarves, a cycling elephant, a gigantic dinosaur, and quite a few princess scarecrows along the main street. 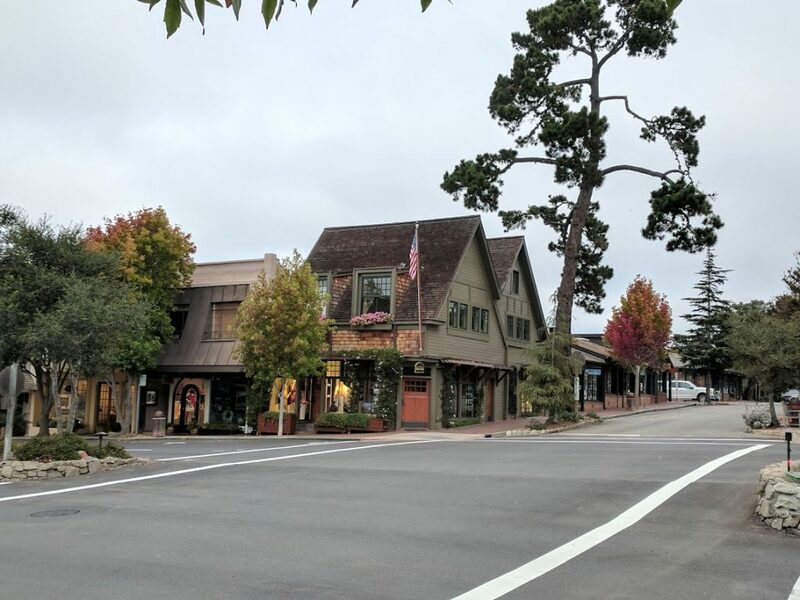 The centre of Cambria is really walkable, and includes a tonne of antique stores to puruse. It’s also packed full of restaurants, cafes, and there’s even a pub that we ferretted out. Go for a walk along Moonstone Beach Boardwalk, named for the stones that would wash ashore and be taken home by tourists in the early 1900s (and probably before). Now it’s a nice walk along the coast, where you can see minke whales if you look hard enough. There are lots of water-based activities a well, such as renting a kayak or going on a group sea kayaking tour. Just 45 minutes south of Cambria lies San Luis Obispo, one of the more well known cities between San Francisco and Los Angeles. If you were excited by the idea of kayaking in Cambria, you’re going to love San Luis Obispo (also known as SLO). A colleague swears that SLO is his favourite place in the world, even over Disneyland. And this guy’s a Millenial, so you know that he’s serious in his kudos for the 45,000-strong city. There’s kayaking here too, but you can also go outdoor rock climbing whether you’re a beginner or a seasoned expert. 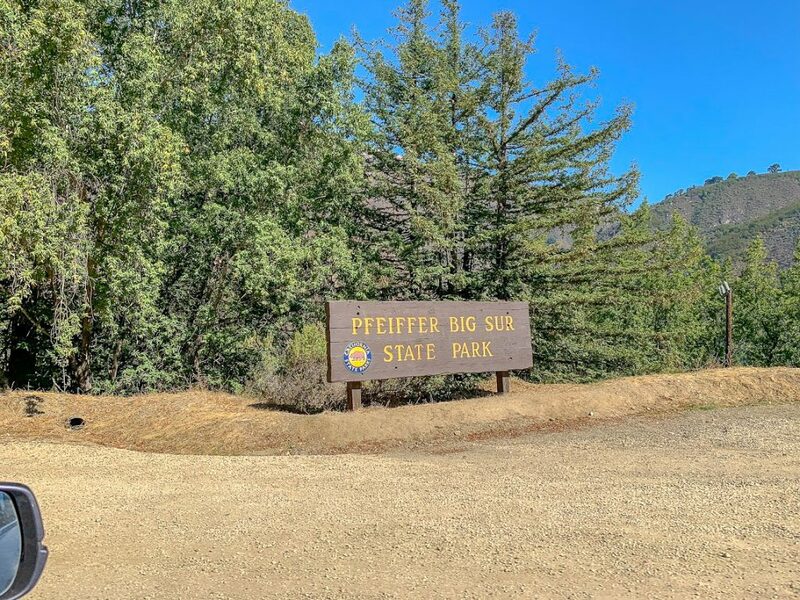 Head to the Seven Sisters chain of volcanic ‘plugs’ starting in downtown SLO and lead to Morro Bay, for some of the easier climbing. There are even some outdoor classes to help with the basics. You can also try mountain biking if you’d like to stay a little closer to the ground. You can take your vehicle “off roading” at the La Panza Off Highway Vehicle Area, which stretches 45 miles of 4WD adventure and challenges. You can also try out the Rock Front Off Highway Vehicle Area for more scenic views while you tackle ridges and canyons. 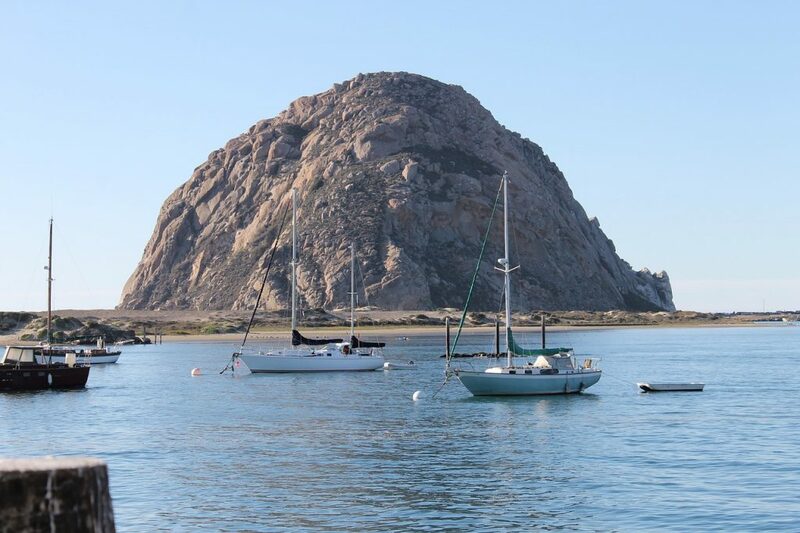 If you’re sick of land for the moment, there are also quite a few boat tours and cruises that you can take advantage of in SLO. Or get some pampering at one of the many spas and salons. Where to stay in San Luis Obispo: The Petit Soleil San Luis Obispo. You can’t pass up Pismo Beach, especially if you were a Loony Tunes watcher as a kid. When we visited they were rebuilding the boardwalk, and we wandered around for a couple of hours to see what was around. 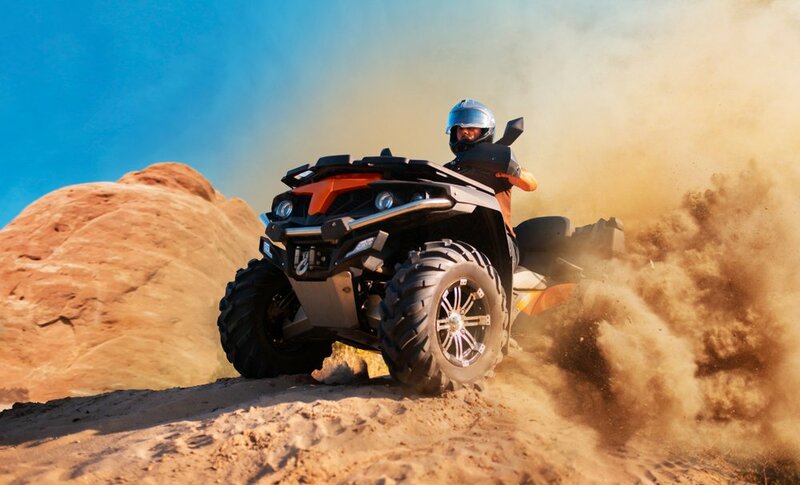 What we didn’t know though, was that you can rent an ATV or dune buggie and drive on the Oceano Sand Dunes. It’s where parts of Pirates of the Carribbean and the Ten Commandments were filmed. It’s also the only beach in California where you can drive on sand dunes. You’re on the home stretch now, getting closer to Los Angeles. An hour’s drive south west will get you to a little town in the Santa Ynez Valley, founded a little over a century ago by Danish immigrants. Solvang was modelled on their homeland, right down to the thatched roof buildings, and other traditional architectural features. There are also plenty of windmills around to, just in case you forgot where you were for a second. Solvang is also home to a vintage motorcycle museum, that holds European racing bikes and other rare crotch rockets. And there are more bakeries than you can shake a stick at, all the better to sate your need for pastries! 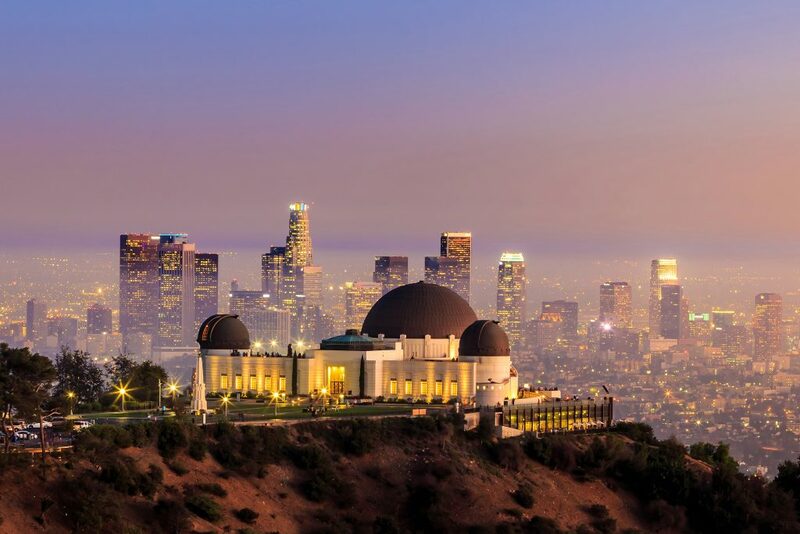 The Griffith Observatory is the place to go if you want scenic photographs of LA. Just two and a half hours drive south west and you’ve made it to the City of Angels! There’s always lots to do in LA, like seeing the Hollywood sign, visiting Disneyland and Universal Studios (for the Wizarding World of Harry Potter of course), eating at fancy restaurants, and seeing miles of street art in the Arts District. You’ll get some of the best views of LA from the Griffith Park Observatory, but it is a popular spot so you might have to battle for parking. You’ll also need to take a walk down Hollywood Boulevarde, to see the stars, and visit the Chinese Theatre, where movies routinely premiere. The courtyard is covered with the hand and footprints of Hollywood stars. There’s also The Broad contemporary art museum, which opened a few years ago, and is one of the most popular museums in town. Head to Santa Monica Pier for a boardwalk full of carnival rides and fun.